Hello again! I hope you are all having a wonderful Labor Day and enjoying the last weekend of summer, well unoffical end of summer to many. While I know it isn’t fall yet but I’m craving this Apple Brussels Sprout Fall Salad (originally posted 2 years ago) and everything apple right now! Getting home late lasts night from spending a week up in Ely and the BWCA with lots of rain and days where the high was 55F, yes 55F, it was far from summer. I came home craving fall foods but not pumpkin. I actually laughed at all the places we pasted advertising pumpkin drinks, bagels, lattes, ect. Don’t get me wrong I like pumpkin but I’m all about apple, sweet potatoes, chai, caramel, and the fall flavors that come before pumpkin. Since it’s warmer here back home I won’t jump into baking just yet but stick to salads like this, adding apples to my oats, and any way to enjoy fresh crisp apples. 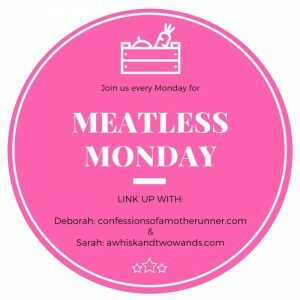 It is Meatless Monday and I’m going to keep is short as it is a holiday, and I’m drained, but I hope you link up with Deborah and I for Meatless Monday and maybe find a new recipe or two below to make this week. The girls start school this week and I’m looking to get back in the kitchen this week as I haven’t been spending much time there lately as mentioned last week and more to come on that on Instagram tomorrow and if you miss it there I’ll be sharing more in my next post. Hope you all have a great week! It’s fall and while traditional green salads have taken a back seat to all the fall veggie salads sometimes you just want to break things up with green salad. 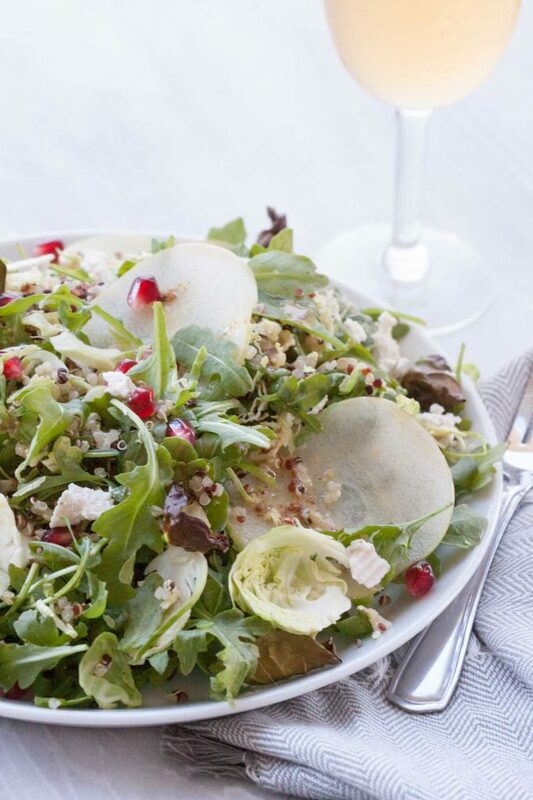 This Apple Brussels Sprout Fall Salad is a twist and best of both worlds. When it comes to fall salads I still want all the healthy toppings but a heartier salad. I have two versions of this salad, one I’ll be sharing with you today. It was a salad combination that first started with a thrown together lunch with leftover quinoa. I like using leftover grains in salads and than adding other fruits and veggies we have on hand. I had to remake the salad and tweak it after having salad last week at the workshop I attended. They had a salad with arugula, barley, apples, brussels sprouts, and blue cheese. It was so close to a salad I’ve been enjoying only they did something genius that made a huge difference, they had roasted brussels sprout leaves in it. They added so much flavor! I couldn’t believe I had never thought of it so I had to try it in my salad and it was such a big difference adding another layer of flavor. I don’t know about you but when I roast brussels sprouts my favorite thing to do is sneak all those crunchy loose leaves when I pull them out of the oven. I use to tell S they were burnt but she finally caught on to me and started sneaking them too! The hardest thing about this salad was resisting the urge to add dried cranberries. I know some of you are thinking is every recipe she posts this fall going to have cranberries. Nope because I have a delicious pie coming Friday that doesn’t have cranberries! Haha! I did leave them out of this version of the salad and swapped them for pomegranate arils. 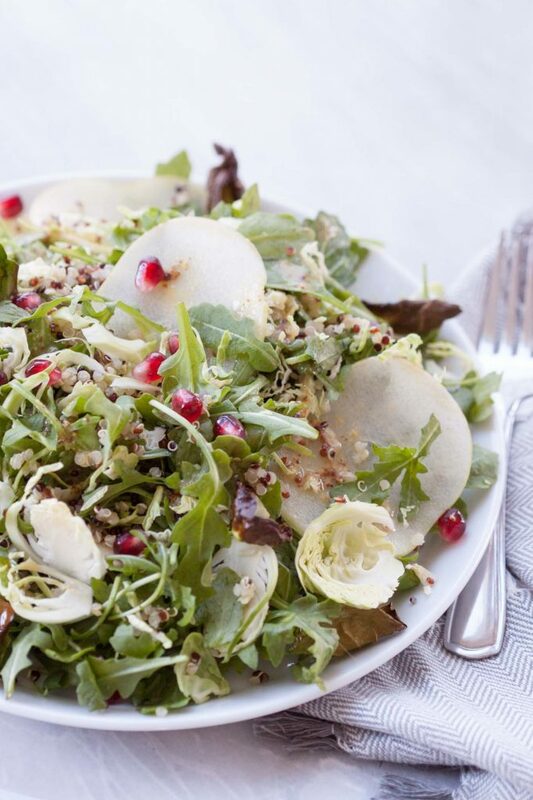 So much flavor is packed into this salad, arugula, shaved brussels sprouts, crispy roasted brussels sprouts, quinoa, apples, pomegranate, and optional cheese crumbles! If you can do dairy/cheese blue cheese is a great otherwise I’m liking Kite Hill Artisan Nut Cheese (I buy it at Whole Foods). It’s also delicious without the cheese which I usually leave off for a quick salad or lunch. If you’re looking for a “green” salad to make for the holidays this is a delicious option! It’s not only pretty but it tastes as good as it looks. It also makes a big filling salad that will go a long way. Don’t worry if you have extra it’s so good the next day, as long as you serve the dressing on the side and add the roasted brussels sprouts just before. Even if you toss them in the salad and they loose some crunch you still have the delicious roasted flavor. When it comes to dressing I’m not a big or heavy dressing person so I like to use a Cranberry Pear White Balsamic Vinegar or one of the other balsamics I have but for a quick and easy dressing I go with a Maple Mustard Vinaigrette. Another option if you aren’t adding cheese is Maple Tahini Dressing, it pairs great with the brussels, apples, and pomegranate. Don’t just give up on salad season yet, it’s just getting it’s second with all the delicious fall flavors! 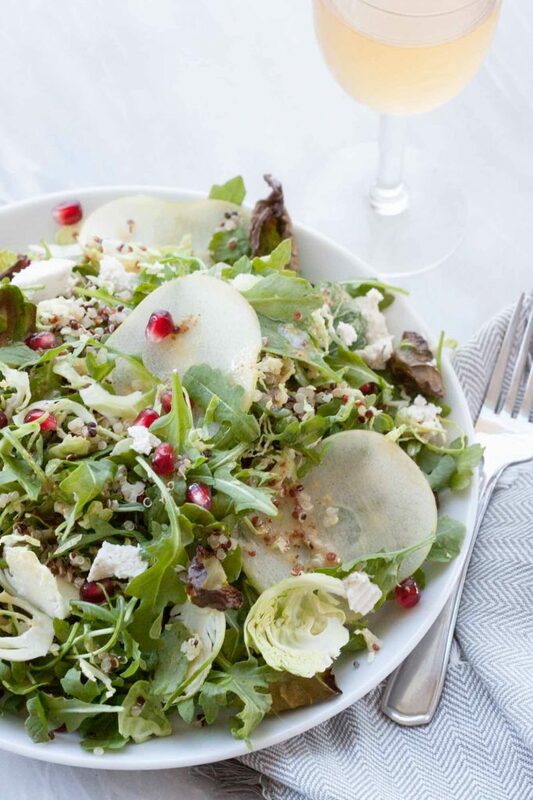 Apple Brussels Sprout Fall Salad is packed with flavor and nutrition pairing shaved and roasted brussels, arugula, apples, pomegranates and more! Perfect for a main dish salad, side dish, or even a salad to bring to Thanksgiving or any get together. Vegan and gluten free friendly. Preheat oven to 400F. Cook quinoa according to package instructions and chill. Spray 2 rimmed baking sheets with non stick spray, I like coconut oil. For quick clean up you can line pans with foil and than spray. Cut ends from brussels sprouts and pull the outside leaves off of the sprouts and lay on the baking sheets. You will want a good sheet to two layered with the brussels sprout leaves. Once you have a good layer spray with coconut oil spray and sprinkle with just a hint of sea salt. Bake for 10 -15 minutes until brown and crispy. Take the remaining brussels sprouts and shave them with a mandolin. 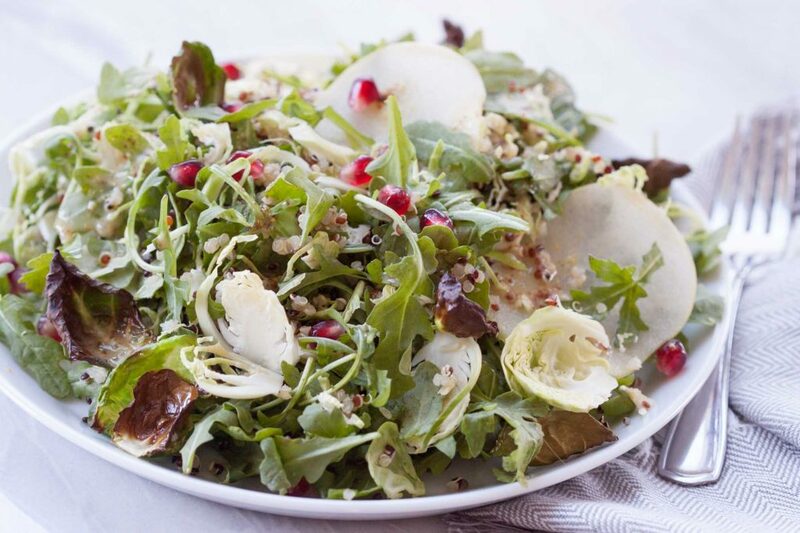 In a very large bowl combine arugula and shaved brussels sprouts. Slice your apples thinly with a mandolin, remove seeds, and place in a bowl with lemon juice and water to prevent browning. 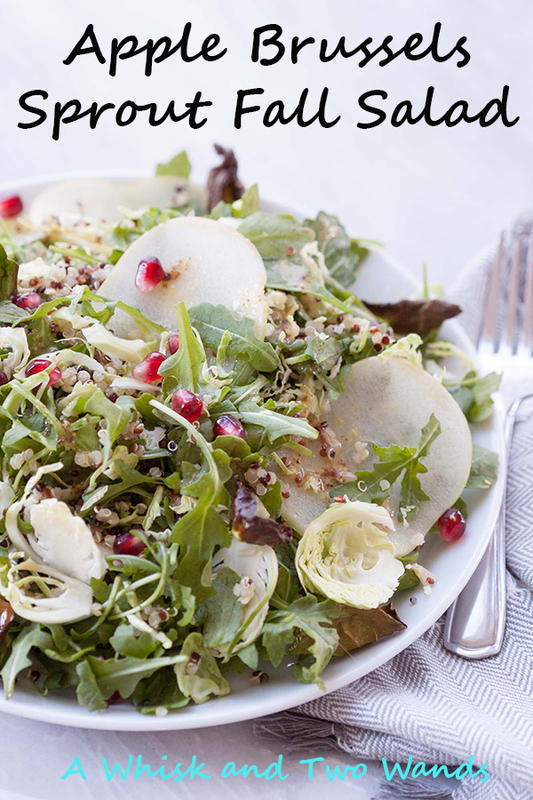 Once quinoa has cooled toss arugula and brussels sprout mixture with quinoa. Mix dressing ingredients together, keep in the refrigerator until ready to use. Either toss in the roasted burssel sprouts, apples, pomegranate arils, and optional cheese if using or plate and top with the toppings. Serve with dressing on the side. Enjoy! If wanting to make without slicing and shaving brussels and apples. You can pull the leaves from brussels to roast and buy already shaved brussels sprouts (you will need 4-5 cups), and chop apples with a knife. If serving at a get together you can toss everything together except the roasted brussels, keep those in an airtight container and add just before putting out/serving. Pomegranate arils can be swapped for dried cranberries. Another dressing favorite is Cranberry Pear White Balsamic Vinegar or if not adding cheese Maple Tahini Dressing. Such a great crunchy fall salad! Yes so much texture and flavor! You’ve been making such great use of fall produce lately! Thank you! I just can’t get enough and I’m not just stuck on pumpkin this year. haha! 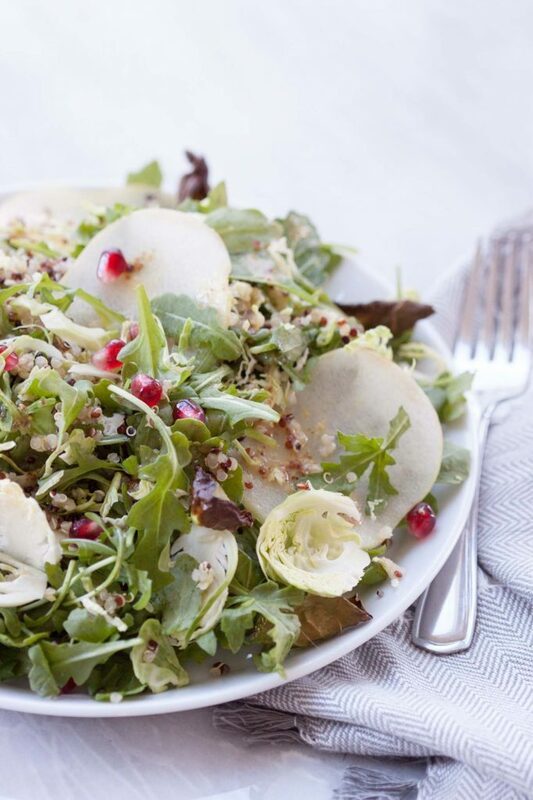 Love that you topped your salad with pomegranate seeds! Thank you! I also like dried cranberries on it! Ok, so I’m on a mission to ‘enjoy’ brussel sprouts, and this recipe could be the one. Pairing the apples with the brussel sprouts makes good flavor sense. We can get the vegan cheeses like Miyoko’s too, so that will work well here. Thanks! Oh I hope you find a way to love brussels! Roasted are definitely our fav. The Miyoko’s Fresh VeganMozz (a fav) didn’t do much here and I’m not a fan of the Garlic Herb. They were out of the other ones. Do you have one of theirs you would use? I love the idea of deconstructing the sprouts into leaves for a more subtle, but pervasive, flavor! Yes so much flavor and crunch! Thank you Susie! This looks SO good! We love honeycrisp apples. I’m with you, I just want to add dried cranberries to every salad, lol. Thank you! Happy to hear I’m not the only one. My oldest takes salad with just romaine, dried cranberries, and apples to school all the time. No dressing or anything it’s her go to. I love how easy this is to pull together. Such a great combo of flavors! What a wonderfully comforting salad! I really need to try more of the Kite Hill cheeses. I’ve only sampled wee little bits at Expo West. Thank you Alisa! Yes I love many of their cheeses. I had tried only one or two before Expo West but it opened my eyes to so many more! This is gorgeous, Sarah! I love the unexpected swap from cranberries to pomegranate. Gorgeous, bright photo too! Thank you Julie! You like that surprise… 😉 Thank you I’m actually enjoying taking photos now and don’t even want to share some of the other posts I had in que. Thank you Sonali! Yes there is so much to love about it. Oh it was a struggle but sometimes you have to step out of your comfort zone, haha! This salad is absolutely gorgeous! I am just starting to get into brussle sprouts and I think I would really like this! Thank you Amanda! I’d love to hear what you think if you try it. This is my kind of salad! Looks fantastic!! I love the different flavours and textures here from the quinoa and the apple and the cheese and the brussels sprouts!! And that dressing!! LOL Those dried cranberries are hard to resist! But pomegranates are an excellent substitution! This looks so yummy! This fall salad is gorgeous! Love all the flavors going on! I’m with you at the moment on holding off on the baking. This salad is the perfect way to get all fall but in a cool way. I really like the idea of adding quinoa in here! I am in love with this recipe! Every single ingredient speaks to me and says “eat me….”! This is the perfect fall salad!